A breathtaking selection of the rarest American bibles went on exhibit last week at the New-York Historical Society. In God We Trust: Early Bible Printings from the David M. Rubenstein Americana Collection puts on public display, some for the first time, the most significant examples of early American religious texts. 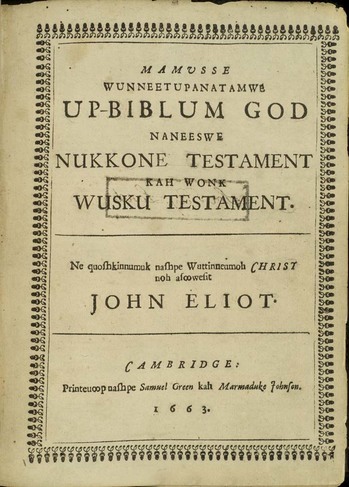 The first Bible printed in America: John Eliot’s “Indian Bible,” Mamusse Wunneetupanatamwe Up-Biblum God. Cambridge, 1663 & 1661. David M. Rubenstein Americana Collection. 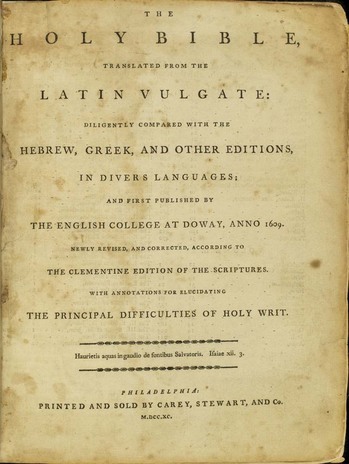 The first Catholic Bible printed in America: The Holy Bible, Translated from the Latin Vulgate. 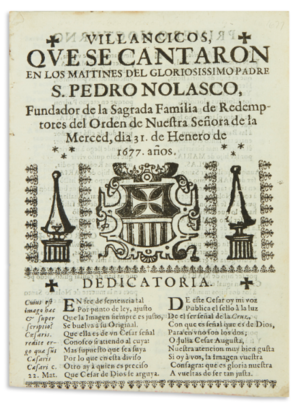 Printed by Carey, Stewart, and Co., printers. Philadelphia, 1790. David M. Rubenstein Americana Collection. 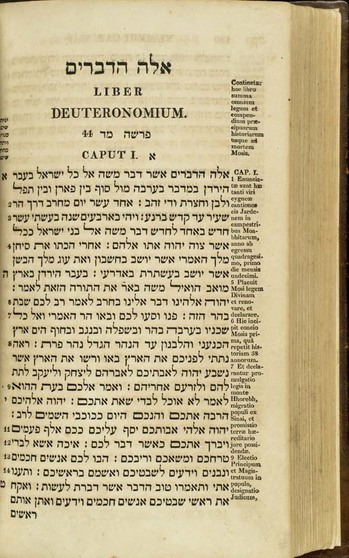 The first Hebrew Bible printed in America: Biblia Hebraica. Printed by William Fry, printer; Thomas Dobson, publisher. Philadelphia, 1814. David M. Rubenstein Americana Collection. 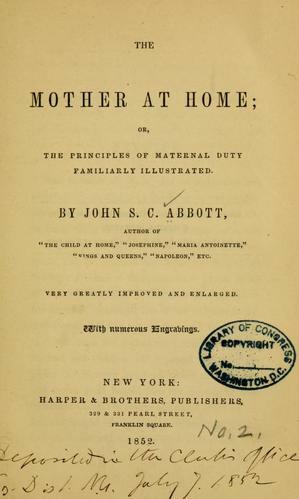 “We are thrilled to display these outstanding examples of early American books, many never before seen by the public and all fruits of Mr. Rubenstein’s passion for collecting American history in the service of the public good,” commented Dr. Louise Mirrer, New-York Historical president and CEO, in a press release. The exhibition will be on view through July 28. 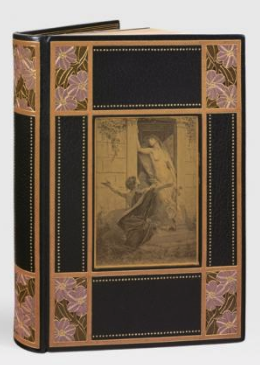 On Thursday, April 25, ALDE sells the library of collector Guy Bigorie, in 250 lots. Estimates are mostly in the three- to low-four-figure range. Some expected highlights include Leconte de Lisle’s Les Érinnyes (1908), with original watercolors by Franz Kupka at €6,000-8,000, and a number of lots all estimated at €4,000-5,000: Chenier’s Les Bucoliques (1905) in a binding by Charles Meunier and with additions; a set of three Flaubert volumes bound by Georges Mercier (1892-1895); Gautier’s Mademoiselle de Maupin (1883) with original Paul-Albert Laurens watercolors and a Gautier autograph poem; Gautier’s La Chaîne d’or (1896) with original drawings and watercolors; mockups for an unfinished Pierre Louÿs work (~1903); Maupassant’s Contes choisis (1891-1892) with an added album of 25 original drawings; and Musset’s Les Nuits (1911) in a striking binding with additional material (pictured below). Potter & Potter will sell The Magic Collection of Ray Goulet on Saturday, April 27, in 565 lots. The only known copy of a 1911 letterpress broadside advertising a Houdini show at the Southampton Hippodrome, inscribed by Houdini to his magician and collector John Mulholland, rates the top estimate at $15,000-25,000. The auction house notes that British law required that a show be staged before a live audience in order for it to be protected by copyright, and that this performance may have been put on for “an audience of one.” A copy of Harry Kellar’s A Magician’s Tour (1886), incribed by Kellar to magician Howard Thurston, is estimated at $2,500-3,500. Quite a few interesting lithographic posters, &c. in this sale, too. Literary forgers have plied their trade as long as there’s been something worth copying, “creating” purely for financial reasons or simply being able to get away with it. Throughout history, some forgers have been content to “gild the lily,” so to speak, while others attempted to rewrite history. Some fakes were so good they did alter history. Notable literary hoaxes include a document in Emperor Constantine’s hand circa 756 AD that donated land to the Catholic Church. Scholar Lorenzo Valla proved it was a fake in 1440, but the Church suppressed Valla’s findings until 1929 when it finally returned the land in question to Italy. Sometimes, forgers were seeking approval. In 1794, eighteen-year-old William Henry (W.H.) Ireland showed his bookseller father (and Shakespeare aficionado) a mortgage bearing the Bard’s signature, which happened to turn up in the law office where young W.H. worked. More Shakespeare papers continued to miraculously appear out of this same office, including a love letter and a hitherto unknown Shakespeare play called Vortigern. The Irelands showed the script to a local theater operator, who smelled something fishy but went along with the charade, going so far as to stage it. But the actors, unwilling to play along, eviscerated it in its solo performance, thoroughly mocking Vortigern to the point that W.H. eventually confessed his forgeries. His poor father, meanwhile, insisted until his death that the discoveries were real. Even Renaissance antiquarians were duped by fabricated testimonies. French humanists like Francois Rabelais believed that Latin texts itemizing the existence of ancient Roman relics beneath modern cities were authentic. In fact, these bogus “revelations” were created by 16th-century forgers cashing in on humanists’ desires to verify their noble Roman heritage. Book collections have been intentionally built around forgeries as well--Arthur and Janet Freeman amassed over 1,700 volumes of literary fakes, dubbed the Bibliotheca Fictiva, which was acquired in 2011 by Johns Hopkins University. This collection inspired the recently published Literary Forgery in Early Modern Europe, edited by Walter Stephens, Earle A. Havens, and Janet E. Gomez (Johns Hopkins Press, $54.95). 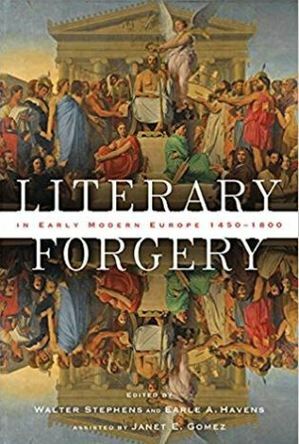 Thirteen essays composed by some of the world’s leading humanities scholars explore the notion that early forgeries form their own literary genre and, rather than being derided as knock-offs, fakes are very much worthy of serious scholarship. Truth-twisting, outright fabrication, and efforts to uncover forgeries through history make for entertaining academic investigations, revealing the thin line between what’s real and what isn’t, and why so many people, from collectors to scholars, are willing to overlook inaccuracies. Victorian art critic John Ruskin got it half right when he wrote in 1843 that, “the essence of lying is in the deception, not in words.” Literary Forgery argues that it’s both. We learned via the Exlibris list earlier this week that a Little Blue Books bibliography, in the making for more than fifteen years, has been published online by Jake Gibbs. Along the way, Gibbs amassed a collection of 20,000 Little Blue Books, according to the bibliography’s preface. 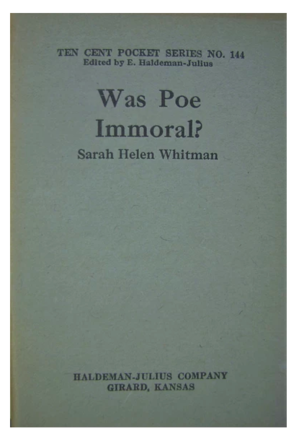 He also examined collections at more than twenty college and university libraries. 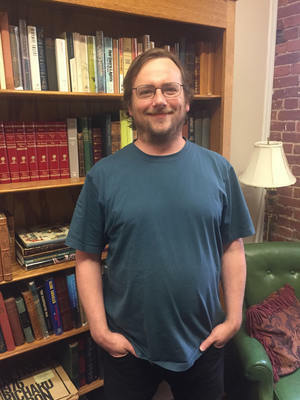 As some readers may recall, Steven Cox, the curator of special collections and university archives at Pittsburg State University (PSU) in Pittsburg, Kansas, where the Haldeman-Julius Collection is located, wrote a short history of the Little Blue Books in our summer 2018 issue. Like Cox, Gibbs was inspired by G. Thomas Tanselle to study this once ubiquitous series founded by Emanuel Haldeman-Julius. 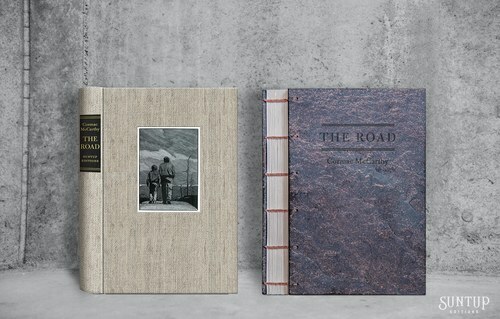 Suntup Editions, California-based publisher of fine limited editions, will be publishing a special edition of The Road by Cormac McCarthy. The publication will include an exclusive introduction by Joyce Carol Oates, seven illustrations by Ryan Pancoast, and a wood engraving by Richard Wagener. Limited to 276 copies, the edition will be presented in both Lettered and Limited states and signed by Oates, Pancoast, and Wagener. McCarthy’s The Road, a post-apocalyptic novel about a father and son on a journey through a desolate America, won the Pulitzer Prize for Fiction in 2007 and is widely considered one of the high spots of 21st century literature. The Limited Edition will be published in full cloth and limited to 250 copies. The spine will feature a leather foil-stamped label and the cover will include an inset print of the Richard Wagener engraving. Endsheets are Hahnemühle Bugra and the edition is printed offset on Mohawk Via Vellum Flax paper. It will be housed in a cloth covered slipcase. The Lettered Edition will be published in a hand-sewn Coptic binding with waxed linen threads and limited to 26 copies (A-Z). It will be printed on French Speckletone paper. The pastedown will be Mexican Mayan acid-free paper, handmade with renewable plant fibers. The frontispiece engraving will be a printed letterpress from the original boxwood block. It will be housed in a custom clamshell enclosure. Publication is scheduled for Fall 2019. Collectors can pre-order the book currently at https://shop.suntup.press. 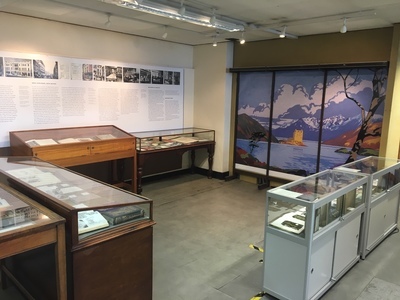 The small but interesting exhibition celebrating 175 years of the London publisher Batsford (now an imprint of Pavilion, based in nearby Bloomsbury) is fittingly being held in the capital’s Holborn area where Bradley Thomas Batsford first set up shop in 1843. The last of the 18th-century publisher-booksellers, Batsford initially concentrated on medical titles but quickly focused on art, architecture, fashion, and heritage. The exhibition--sadly, all displayed in glass cabinets--features a wide range of its highly illustrated titles including Architectural Works of Inigo Jones (1901) by Henry Tanner and Inigo Triggs, Cecil Beaton’s Scrapbook (1937) and Gertrude Stein’s memoir Wars I Have Seen (1945) as well as the iconic colorful artwork produced for the travel titles by Brian Cook, one of the Batsford family himself. There is also a copy of J.K. Colling’s English Medieval Foliage and Coloured Decoration (1874) on show, the first publication released under the Batsford imprint, plus more recent unusual titles including the guidebook London and the Single Girl by Betty James (1967) and The Cat-Lover’s Bedside Book edited by Grace Pond (1974). 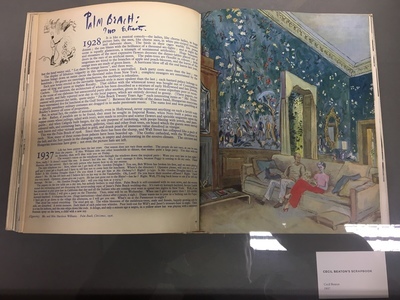 Curated by Frida Green, Vaughan Grylls, Helen Lewis, and Tina Persaud, Batsford: 175 Years of a Bloomsbury Publisher runs until June 28 at the Camden Local Studies and Archives Centre.